My work e-mailbox is hosted on an Exchange server and is very limited in size (only 100 MB) so I use a PST file to archive mail when it’s full. This has of course several disadvantages such as possible corruption on the PST and some limitations. 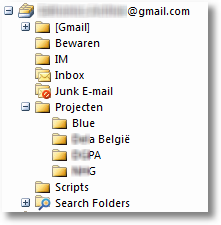 I open my mailbox from severals places: Outlook on my laptop, Outlook Web Access remote (no PST available in OWA), Outlook from my Virtual Desktop (no PST since it’s located on my laptop) and so on. I just installed my laptop with Windows 7 (x64) and I was curious how the new Windows XP mode worked (more on that topic later). After installing it I could no longer start any Virtual Machines in VMWare Workstation. The VM fired up but immediately halted with the following error: “VMware Workstation unrecoverable error: (vcpu-0)” “VCPU 0 RunVM failed: -2”.